How to declutter your life—the Swedish way. Earlier this week, Niki’s new book, Lagom: The Swedish Art of Living a Balanced, Happy Life (Harper Design) hit US bookshelves. Inside, you’ll find a guide on how to apply the philosophy to everyday life, from decorating the home to de-stressing from work. We set up a little Skype date with Niki at her home in Malmö, Sweden, to hear about her new book—and how we all could use a little lagom in our lives. How did writing for your blog My Scandinavian Home evolve into the book Lagom? The blog has always been my central thing, but it was so brilliant to be able to do something creative around what I was already doing out there in print because I love books. The idea of switching off technology and reading a book is nice. And I started thinking about the idea of the Swedish philosophy of lagom. The Swedes are quite incredible, and they don’t even know that themselves. They really do have this amazing balance. I started to put the two together, and thought it would be so great to write a book about it. How would you describe the philosophy of lagom? In English, there is no direct translation. I have deduced that it is about not too little, not too much—just right. It’s about the art of moderation and balance. And I think the fantastic thing about it is that it’s not the same for everyone. It’s the balance that works for you personally. Your shower could be lagom warm. What is lagom warm for me, my husband thinks is absolutely scalding, and he can’t believe I can even get in there. Your trousers could be a lagom fit. You can work a lagom amount. There is quite a positive connotation to it, too: It means that you don’t have to deny yourself anything. If you want to eat a slice of cake, eat a slice of cake. If you want to get completely drunk and swing from the chandeliers, do that. Just don’t feel like you can’t drink an espresso martini for an entire month afterward. Or, if you eat a piece of cake, don’t feel like you need to do a strict diet for months. The Swedes don’t do that. They just make sure they eat healthily and try to keep a balance. How did you first encounter lagom? I came over [to Sweden] for summer holiday, and it was so great and so chill. It was back to the basics with no schedule. It was very much winging it—going to the cottage and sitting by the sea. It was about making the most of what was there. No one had to do too much and entertain, and it was so easy. It was such an easy life, and I realized that this was the essence of this lagom. It wasn’t doing anything too over-the-top. It was the Swedes slowing down and taking their time to do things in the right way. How do you now incorporate this philosophy into your day-to-day life? Swedes are really amazing about having the type of home that is not cluttered. It is very clean and fairly minimalist. When I wake up in the morning, I feel like my house is calm and decluttered. I have learned from the Swedes how to balance that with warm textiles, layers of texture, and the use of natural materials. There is a balance in the environment when I wake up. Also, when my work day starts, I’ve learned to take a lot of breaks. In Swedish we call them fika (pronounced fee-ka), and it’s absolutely sacred in the country. Don’t ever get in the way of a Swede and their fika break. They will have a really strong coffee and a little treat like a cinnamon bun, and they literally will put their work to the side. And I take them a couple of times a day without any qualms. You need these breaks. Coming from London, we never took any breaks, and didn’t leave our desks at lunchtime. But I found that I really benefit from these breaks, and I do that quite a lot. 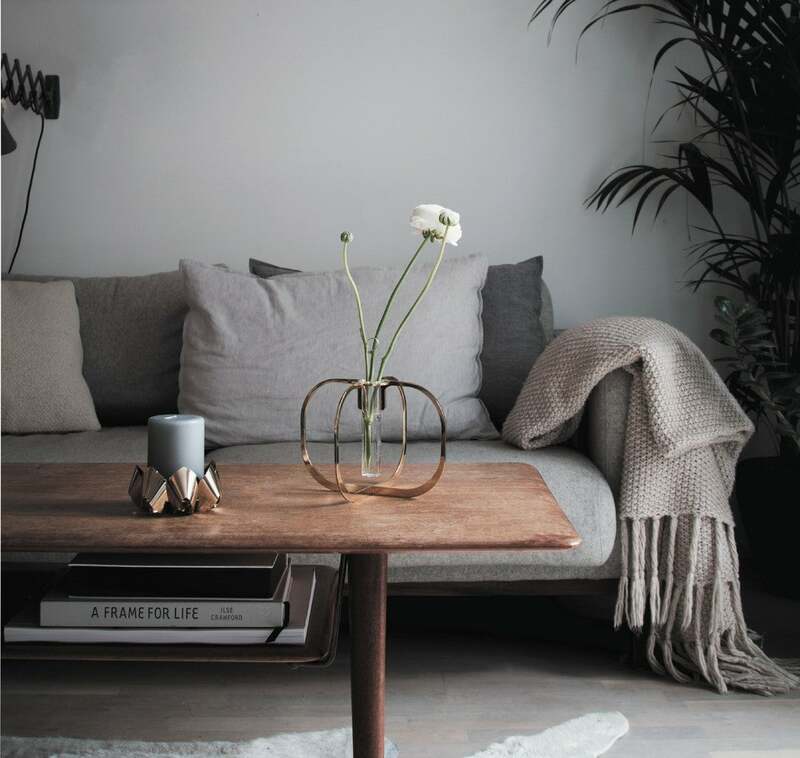 How can you furnish your home the lagom way? When you look at your home, you need to think about balance. Everything in your home should be useful and loved. Swedes are good at finding furniture that combines form and function: It will be practical, and also look lovely. Lagom is also about less is more, and by having fewer items and giving them more space, you can more easily appreciate them. You can see their form better, and they become a centerpiece. Swedes are very good about investing in quality materials—furniture that is built to stand the test of time. It doesn’t have to be new. It can be secondhand or vintage. It’s sustainable. It tells a story, and it’s more meaningful because you know where it came from and why you bought it. It has a little history behind it. Light also is an important part of the home in Sweden because it gets so dark in the winter. Homes are about bringing in natural light—a lot of white and bright colors to bounce light around your house, and not using heavy lined curtains, but using thinner ones that won’t obscure the light. Nature also has massive role in the Swedish home. Swedes have a lot of plants and bouquets. Nothing is really over-the-top or lavish—it’s just simple and fuss-free and pretty. In your book, you talk about how lagom applies to all parts of a person’s life—from their morning routine to how they entertain, and even how it’s important in relationships. Why is lagom essential to leading a happy and harmonious life? If you can find that balance between work and your personal life—giving yourself time to do the things you love—in the long run, you find that balance. If you finish work on time, you give yourself more time for family and your relationships, and you give yourself more personal time to go to the gym and become healthier and happier. If you give yourself more time to do the things you love, you’ll be happier.